Shire, while having little to play for, were looking to build upon their comfortable win over Vale of Leithen last time out with another against a Whitehill side seemingly destined for relegation. It didn’t take long for the away side to seriously threaten an opener when Jamie Gallagher caught his first-time volley sweetly only to be denied a stunning first goal for the club by the frame of Ross Jardine’s goal. Steven Brisbane ensured Shire’s impressive start was rewarded when he latched onto a throw in before firing his side into a deserved 1-0 lead. The onslaught continued with Gallagher spearheading Shire’s attacking play. 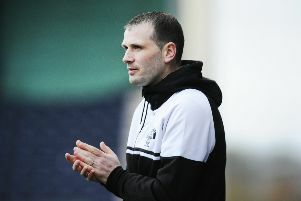 The attacking midfielder showed his class when he slipped the ball through for Ross Allum who applied a typically clinical finish to keep pace with Craig Malcolm in the race for Lowland League top scorer. Whitehill could thank Jardine for keeping them in the tie with Allum and Connor Greene both denied by some heroic goalkeeping with half time looming. Ure’s message to his side at the break seemed crystal clear, maintain the intensity and push for a third goal that would end the game as a contest. However, Shire were almost dealt a surprise blow at the start of the second half when David Maskrey’s shot crept inches wide of the post with Jamie Barclay rooted to the spot. Maskrey’s effort proved to be the exception rather than the rule, however, with Shire reasserting their dominance through Gallagher – but the Shire man saw his effort tipped spectacularly over the bar by an inspired Jardine. The Whitehill keeper was finally beaten in the second half in unlikely circumstances when Shire winger Paul McCafferty found himself unmarked in the box before heading in the third to kill off any hopes of an unlikely Whitehill revival.